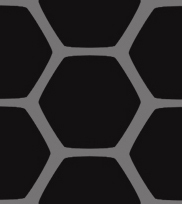 I am currently writing a script for a drama/adventure TMNT comic based on the world war two style and the episode ‘Same as it never was’. The story happens in another earth dimension where aliens, mutants and humans are living together. I will not explain the story here and now because I need to translate before. 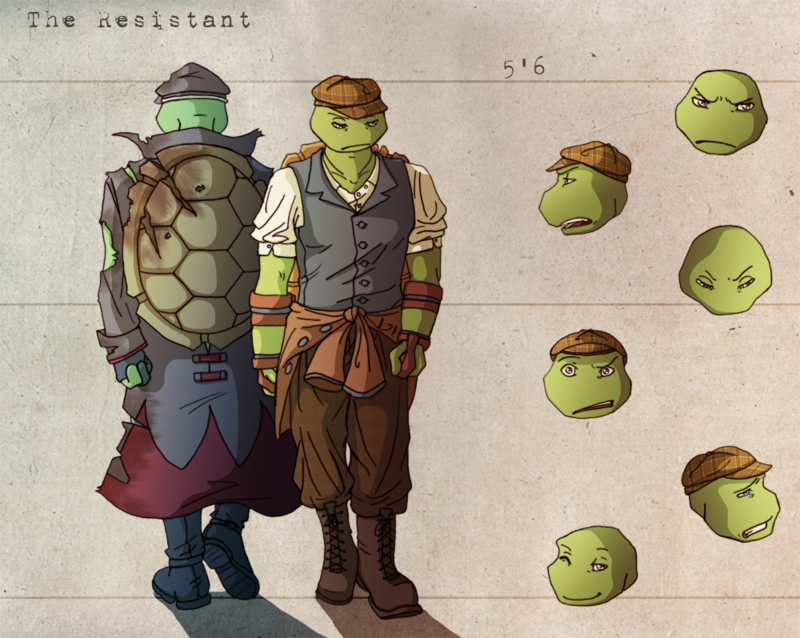 Here is the character design for Leonardo. He is the most complicated character of the whole story. The formal nazi/Resistance outfit. For information on the story/comic, take a look at my journal. Leonardo was the colonel of the South SS group. He indented to follow his father steps : Serve his country and protect its citizens. He realized too late that he has been manipulated just like the whole nation by the ultimate leader; it was no war... but a genocide. Is Leonardo a bad guy in the story? Yes. He killed many, many innocent people. And he is certainly not proud of it. He would never be able to redeem himself, but he will give his life to stop this blood shed. What's the weird things onto his wrists? His weapons; double hidden swords. Totally invisible under his coat, perfect for a surprise attack. Yeah... how it happened is a secret until the comic release. 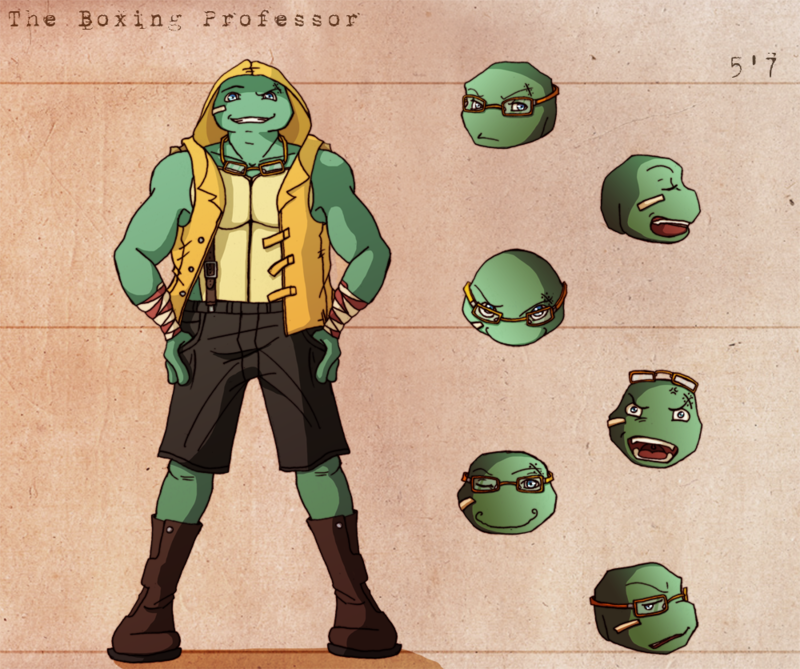 Here is the character design for Raphael. The formal outfit. For information on the story/comic, take a look at my journal. Raphael holds a huge grudge against the enemy for killing his father. He is very clever and ruthless. If he wants something, he,ll do everything in his power to gain it. He does like children, pets… and grandmothers. The anger he holds against himself is launched on the others around him. Is Raphael a bad guy in the story? He follows the bad guys’ orders. And the orders are to kill everyone who is not an ally (innocents included). So yes he is a bad guy. Still, for someone who is from his nation/country, he'll give his life with no hesitation to save that person. Where are his two sai? 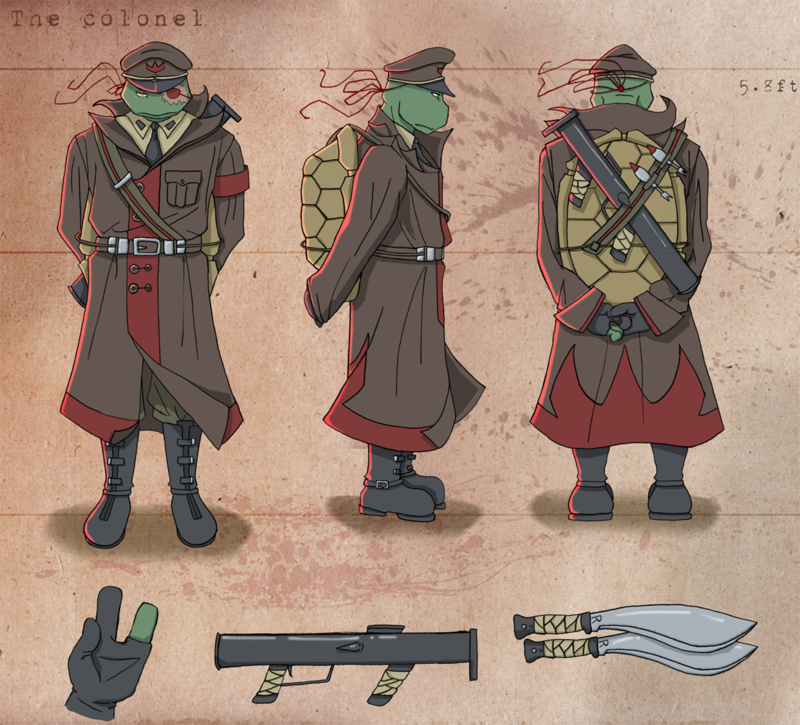 I decided to exchange them with two machetes because in this story, Raphael is not a ninja, but a SS colonel. He hates ties. But when he is in public, since he is a model for every soldiers and citizens, he makes an effort. Donatello is a very comfortable person. He is always smiling, never gets angry and is very loyal. He is clever, but can sometimes be very stupid before obvious things. His passion is to create things and try them afterward. He is one of the best pilots/air fighter of the nation… but surely not the most respected. No. He is a soldier. His goal is to protect the people around him and his country. He will never hurt someone who does not wear a military uniform. Good question. You’ll have to read the comic to know the answer. He is. Don is the smallest turtle in height and muscle mass. Since he is a pilot and does not fight hand to hand, he doe not need to be physically strong, unlike his other brothers. The women same age don`t see him as a love interest because of his teenage silhouette. True, I will draw them another time. 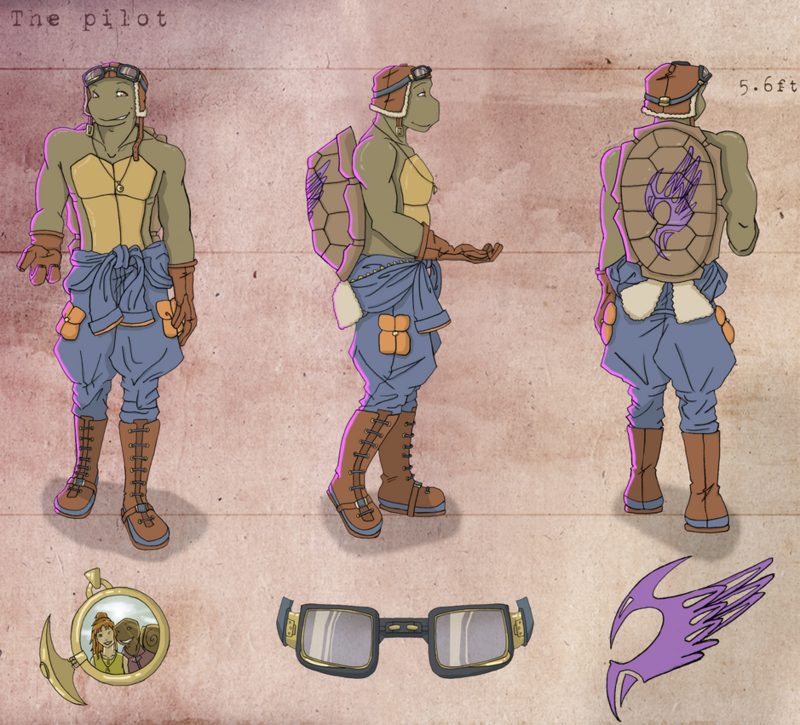 Here is the character design for Michelangelo. And he is the most muscular of the turtles. The training/teaching outfit. For information on the story/comic, take a look at my journal. Mikey is very competitive and likes to win. He can sometimes pressure his students in a wrong way because of this. Still, while not at work, he is a very lovely character and, even if he is very lazy, likes to help the people around him. Is Mikey a bad guy in the story? Yes. Always drawing him with spectacles in human form. (things I do not post because it's too crappy). Wow. Just. Wow. This is amazing! I can't wait to see the comic. I saw those on DA first! Lalunatique, you seriously have a talent! The word ''bad'' in this story is defined by my own preconceptions of the good and the bad XD. Maybe the point of view about ''good and evil'' in this story will be different for you or for my friends than me. Well, they did not chose their side. They were raised in an extremist country. Example: WW2, the Jews were seen in Germany like rats... or a disease. Adults and parents explained this ''philosophy'' to their children, and children grew up thinking Jews were rats. It is the same principle with Leo and Raph. They only wish to follow their models, their culture. True, and yet, not true XD. Let's wait for the story. You can fully be disappointed about their ''roles'' XD. And you will probably be mad at me often during the story development. This is prob a really stupid question and will show how much of a weak point history is to me, but isn't someone who's with the resistance against the Nazis? The resistance is against the Nazis. 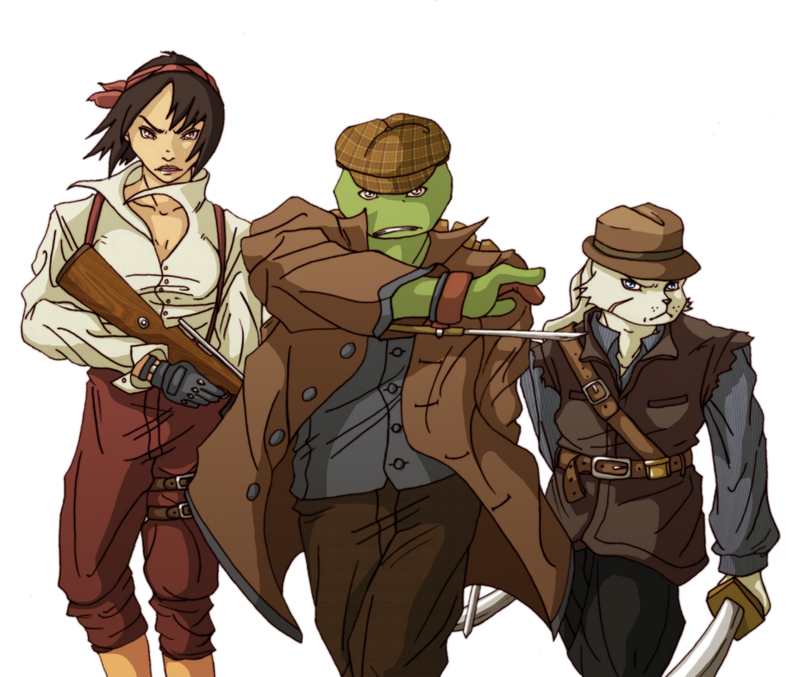 Here is Leo's main team composed of Karai and Usagi. Karai switched of faction just like Leo did. She is an incredible long range shooter. Usagi is the strongest melee figther of the whole Resistance group. He is the one who will teach Leo the art of Kendo: "Way of the Sword". I really cna't wait to see this! It looks so good! I agree! I can't wait for this!!! I love the way you draw! Major jealousy over here! And katanagirl, that's actually a really good question! Five bucks says it's cause comics used to be just the strips in newspapers and then they started selling books of them, which probably became more serious over time. I'm totally guessing here though.